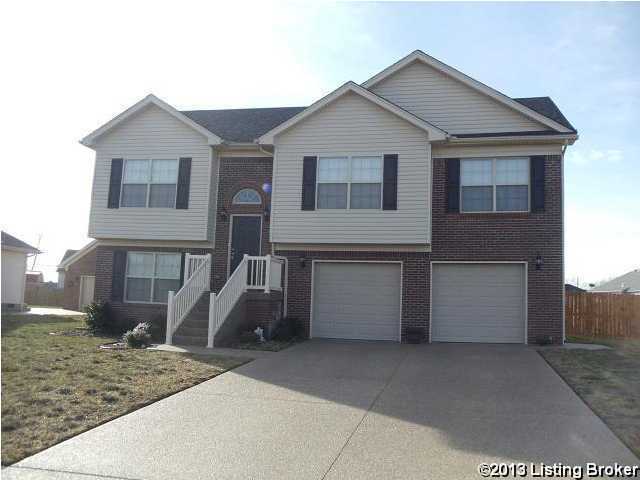 This great floor plan is like new and ready to move into. Level one offers a bedroom and full bath as well as a family room that walks out to the backyard. Level two features a split floor plan with a master bedroom with a master bath and walk in closet. Then there are two additional bedrooms and another full bath and laundry located on this level. The eat in kitchen has plenty of cabinets as well as pantry. Off the kitchen there is a spacious great room that exits to the deck that overlooks a large completely privacy fenced yard. The two car attached garage has separate doors as well as extra storage space and a service door on the side. This home offers a one year HSA Home Warranty for your piece of mind. Direction: Bardstown Road to 44 W to Bethel Church to Gentry to Gentry Crossing, R to St.
Gentry Crossings is a subdivision within the city of Mt Washington, Kentucky. There are currently 0 Homes for Sale within Gentry Crossings, with asking prices ranging from $0 to $0. The average list price per square foot of the available inventory in Gentry Crossings is $0, which is the Mt Washington average of $224. The Average Sales price of all sold real estate in this subdivision for the past year is $169,726. Recent comparable homes have been selling for 99.60% of their asking price. Waterfront homes represent of the available Gentry Crossings inventory. The total number of households in the zip code of Gentry Crossings is 7,255, with an average household size for of 2.66 people. The total number of renter households within the zip code of 40047 is 1,268, which means that 82.52% of households in this zipcode are owner occupant households. LISTING PROVIDED COURTESY OF Gerald K Franklin, Coldwell Banker McMahan Co.
155 Crystal View Ct, Mt Washington KY 40047 is a Home, with 4 bedrooms which is recently sold, it has 1,882 sqft, 75X120 sized lot, and 2 Car Garage,Attached parking. A comparable Other, has bedrooms and 0 baths, it was built in and is located at and for sale by its owner at $ 0. This home is located in the city of , in zip code , this County Other, it is in the Subdivision, and STONE MEADOWS are nearby neighborhoods.